These are "after" pictures of our hall closet, taken this week. 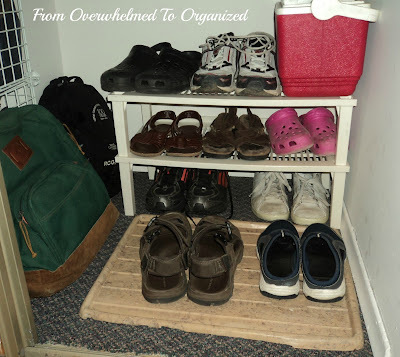 I wish I had taken some "before" pictures but I actually organized it before I started blogging. I'm happy to say that it is still pretty organized 2 months later! All I did before taking these pictures was tidy up the shoes a bit. When we first moved in, this closet just had a shelf and a rod. Actually, it wasn't even a rod. There was a metal "V" shaped strip that hung from the bottom of the shelf. It was attached at the front and had an opening at the back to hang our hangers on. They had to hang backwards though which was always weird. There was also a lot of wasted space in the closet, especially on the left side where it was not very deep because of a large cold air return vent that goes up from the basement to our bedroom above. 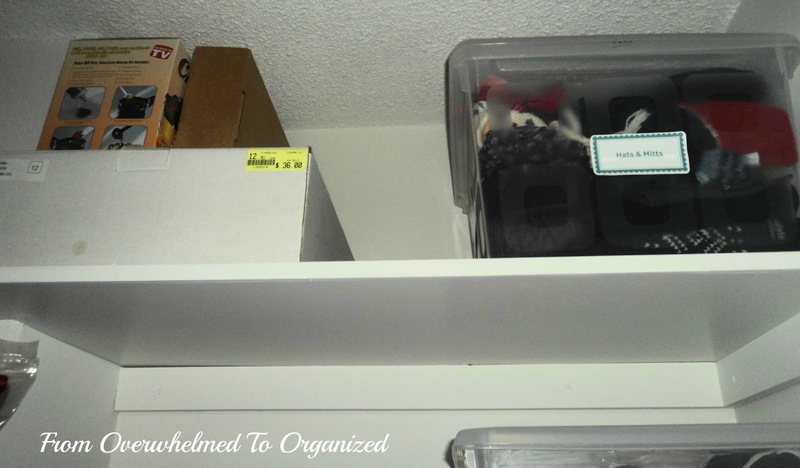 Shortly after moving in, we put in a regular rod and installed another shelf above the one that was there to maximize the great height of this closet. We also put these cubes in front of the shallow part of the closet so we could use that space for storage. 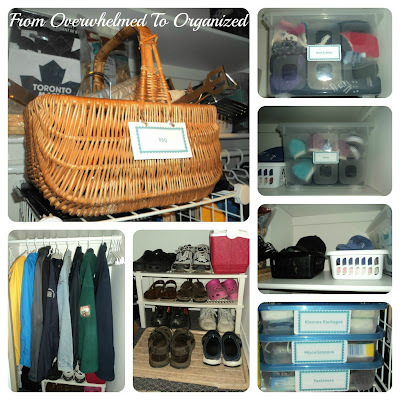 When I organized this closet in the spring, I switched from winter coats to spring/summer jackets and I gave away several extras from both seasons that we weren't using very often. I also painted the closet and we put in some new carpet on the floor (the previous carpet was UGLY, dirty, and 30+ years old!). This was an extra piece of carpet from our basement and is a big improvement! The kids' outerwear is on hooks and in cubbyholes near the front door, so this closet it just for my hubby and I. On the right side we keep our jackets and coats on the rod, and our shoes, sandals, or boots (depending on the season) on the floor, as well as on a 2-shelf shoe rack. 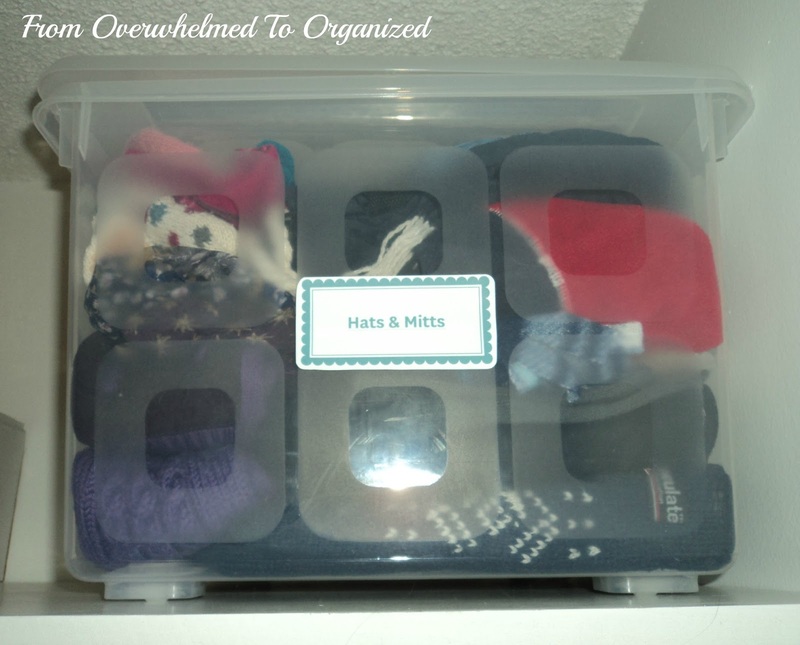 Above the rod, I put in baskets for my hubby and I to hold our hats and mitts in the winter and baseball caps in the summer. The black one is his and the white one is mine. It is great to be able to pull something off this shelf and not have several other things fall down at the same time! These baskets really help contain everything. I also added a bin to put some extra shoes in. They are easy to access and now I don't have as much of a mess on the floor. On the very top shelf we store things we don't use very often, such as the chocolate making supplies that we usually only use before Christmas. 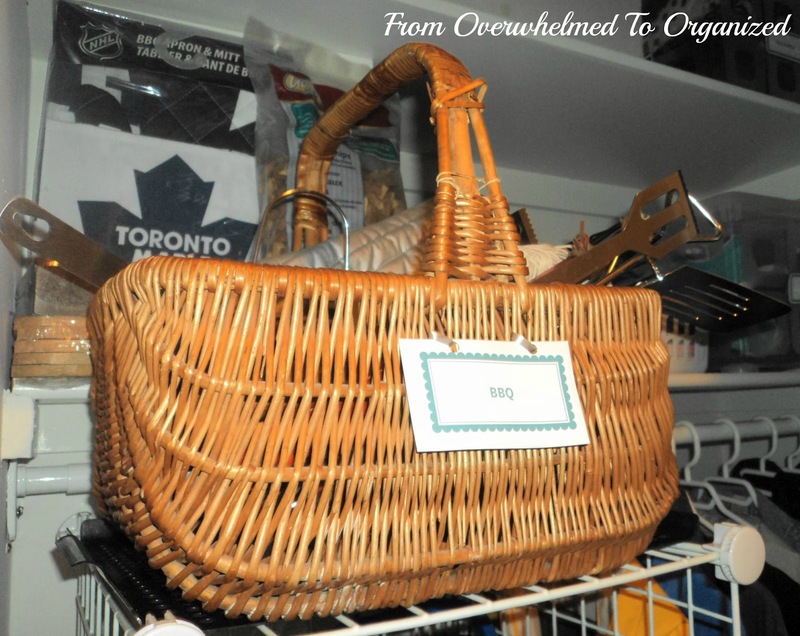 Not your typical closet items, but these are accessible and close to the kitchen if we choose to make chocolates for other occasions, rather than being stored in the garage with the other Christmas bins or in the basement with the other seasonal items. These bins were $7 at Canadian Tire, which is more than I like to spend on smallish sized bins, but I needed a pretty specific size to be able to get a bin up to the top shelf. There are even little wheels on the bottom! Now for the cubes on the left side. Again, I really wish I had taken a picture of these cubes before I organized them. 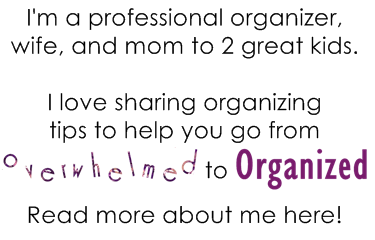 They had not been organized in a long time and they were a mess! Picture stuff crammed in and hanging off these cubes. Yep, it was as bad as you're imagining... maybe even worse! More than once we couldn't open the sliding doors because something had fallen down and was jammed between the cubes and the door. Our kitchen is very small, and because this closet is the only other storage space on the main floor, we use it to hide store things that some people would probably keep in their kitchen. 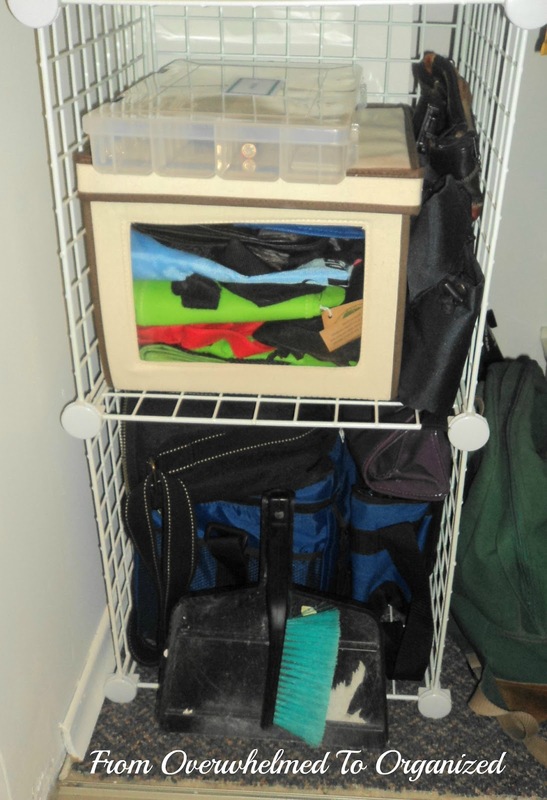 On top of the cubes we store our BBQ tools, utensils, and other BBQ related items in a basket. There are a few BBQ things on the shelf behind too. When I organized the backyard deckbox, I brought in the BBQ items that had been stored in it. It was so nice knowing I had an organized place now in this closet to keep them all together. 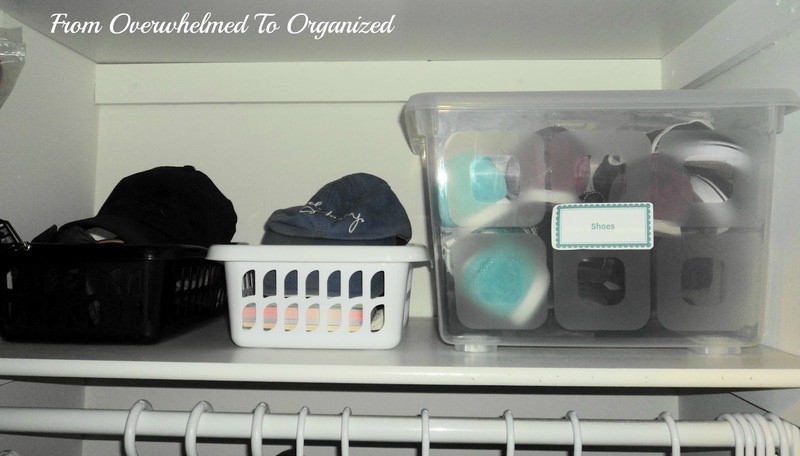 To make sure all these items stayed organized, I sorted everything into categories and grouped them in various containers. I already had the fabric box, the plastic basket, and the wicker basket. And I purchased the two kinds of plastic containers from Dollarama. The battery container was from Walmart (in the hardware section). I think it was around $5. It's not full right now, but sometimes we stock up on batteries at Costco or if they are on sale somewhere, so now we have room to put them in this container when we do. That's it! It's much less crowded in all parts of this closet now which makes it feel freer. 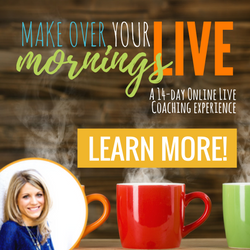 I like going in and out of it now, which is good because I do it multiple times each day! 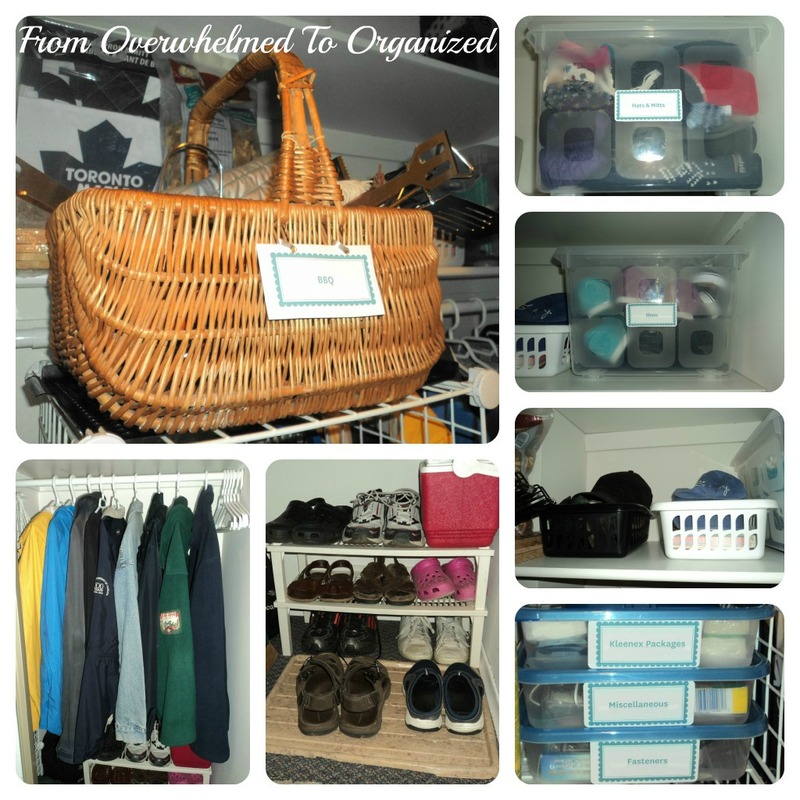 This closet went from overwhelming to organized and I'm so relieved! Both my hubby and I can find things and put them back. What items do you keep in your hall closet? 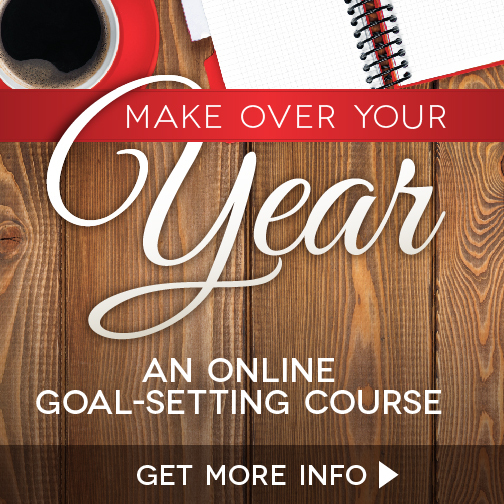 Does your closet get overwhelming? 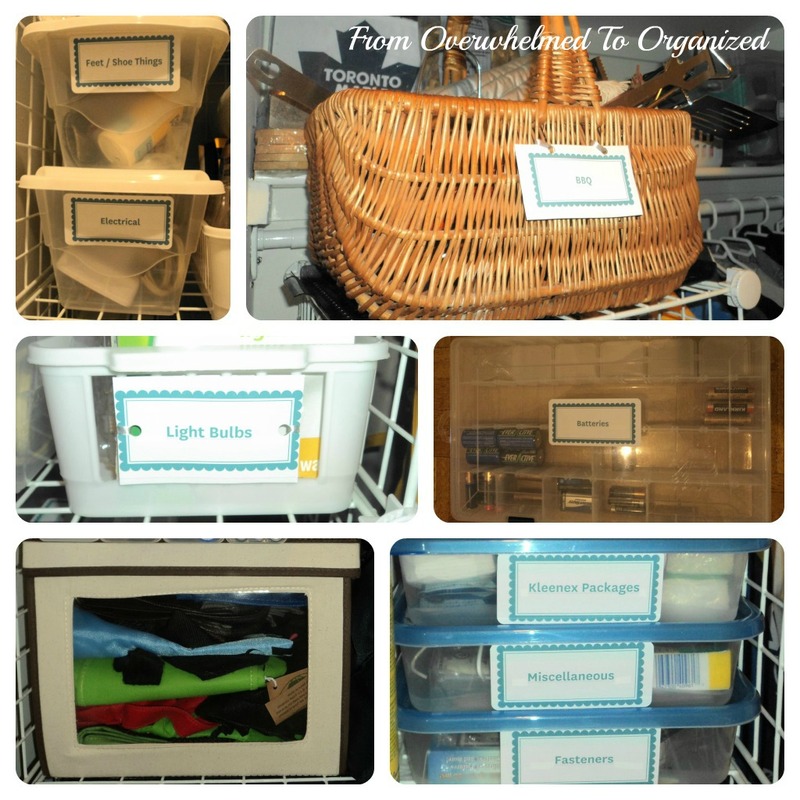 What strategies do you use to keep it organized? I love the basket for BBQ utensils, you could easily grab the whole thing and take it out to the grill! We do a similar thing with hats and gloves. When cold weather comes through we move the crate from the top shelf to the floor of the closet, making it easy to grab a hat or scarf before you leave. Thanks Brandi Lee! So far my hubby has just been taking what he needs out of the basket but that's a great idea to take the whole thing out :) I love baskets! I can't reach that top shelf without a stool so I'm just keeping the hats & mitts up there through the summer. Once we need them again I'll bring them down lower. Hi Hilda, I just found you and I love what you've done with your closet! I love the BBQ basket idea too, I've been racking my brain about what to do with all of our BBQ stuff, now I'll be on the lookout for a cute basket with handle! I really like how you've sorted and labelled everything, I did that awhile back with a large wardrobe we have, we also lack storage space so just like you, a lot of the same stuff ended up stored and sorted there! Thanks Colleen! The BBQ basket is working out great. I highly recommend it! 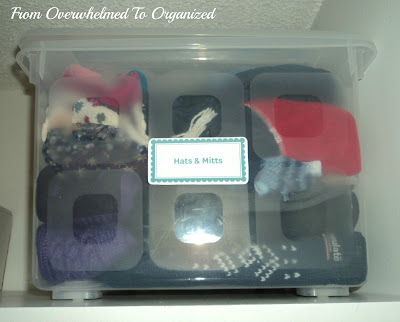 I just checked out your blog & it looks like we both have found ways to be creative with storage so that it works for us. 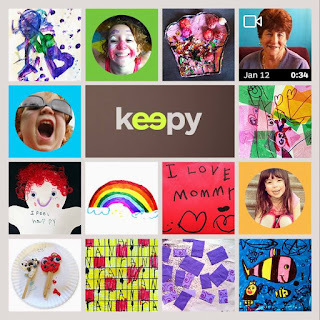 Thanks for commenting & I look forward to seeing more of your organizing projects! It looks fabulous! I have a few closets that just don't seem to stay organized. Thanks allisamazing! 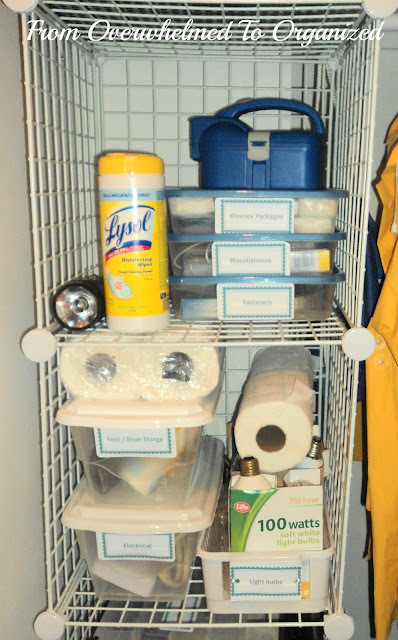 I think the containers have really helped keep things organized (instead of just shoving things everywhere like I used to!). 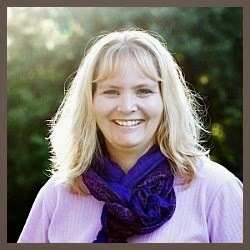 Just checked our your blog...I love the photo at the top & your Canada Day decorating! Happy Canada Day! Thanks for the invite Debt Free Mommy! I linked up a few posts. You're welcome Tabitha! I never used to label things but now I've found it really helps me find things quickly and it helps everyone put things back where they belong which means things don't get as chaotic. 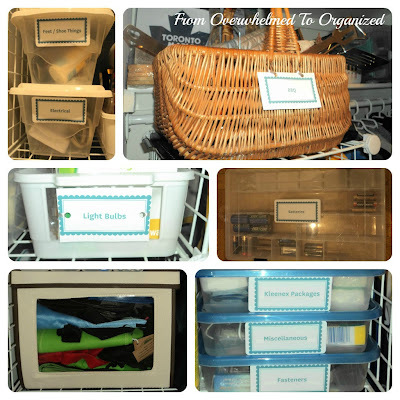 Doesn't it feel good to be organized. I recently tackled my linen closet and couldn't be happier. Yours looks great. It's so important to put things where we'll use them huh! 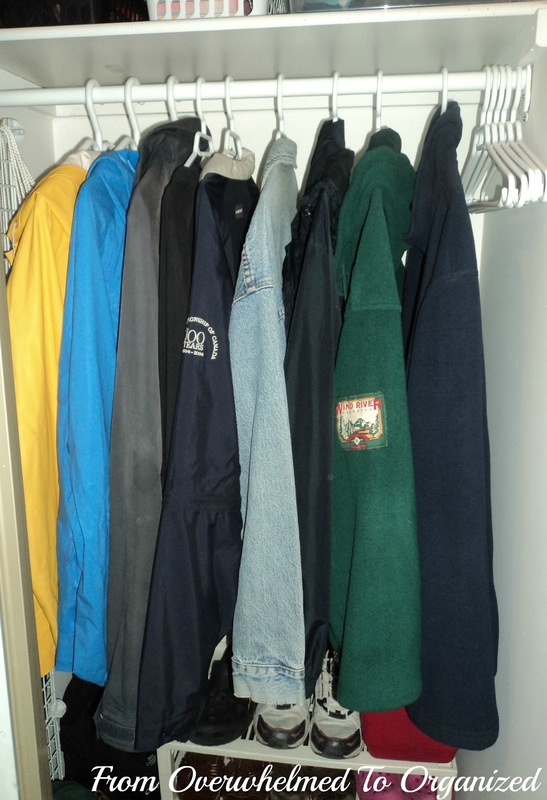 Your coat closet looks great! I especially love how everything is so clearly labeled and easy to find. You made great use of your space.